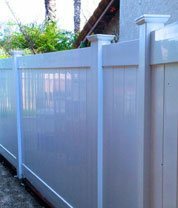 When Santa Monica customers choose J&J Vinyl Fence as their fencing contractor, they are serviced by highly experienced fencing professionals who specialize in fabricating and installing beautiful, multi-purpose vinyl fences at the most affordable prices in Los Angeles County. We are a group of talented craftsmen who genuinely love what we do. We take pride in never using subcontractors, and our owner himself is frequently seen supervising our fencing projects from beginning to end. We are skilled at working alongside homeowner's associations, property managers, general contractors, commercial property owners, and homeowners to expertly complete Santa Monica vinyl fencing jobs within budget and in a timely manner. In addition to vinyl fencing, we also specialize in constructing and installing vinyl arbors and aluminum fences and gates. Our vinyl and aluminum fences have been used to secure, beautify, and demarcate everything from neighborhood pools and tennis courts, to hillside properties and ranches. 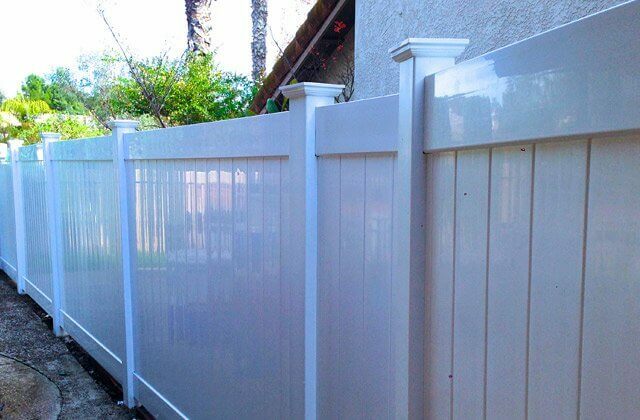 At J&J Vinyl Fence, we have the experience and expertise to customize, construct, and install your Santa Monica vinyl fence in exactly the way you'd like, matching it to the surrounding style of your space. Vinyl fencing comes in any variety of privacy, semi privacy, picket, and ranch rail styles, and comes in a white, tan, or textured wood-grain finish. To learn more about our cost-effective vinyl and aluminum fence installations, call us today. We provide complimentary estimates over the phone or on-location. New customers also qualify for a 10% discount! Since 1978, J&J Vinyl Fence has customized vinyl privacy fences to secure yards and distinguish property parameters. Our vinyl privacy fences can be made to closely resemble traditional wood fencing but saves you from all of the downsides that arise with wood. Unlike wood fencing, vinyl privacy fencing never fades, flakes, warps, or chips, and never requires paint touch-ups or replacements for rotting boards. Privacy vinyl fencing is a contemporary fencing solution for a diverse range of Santa Monica residential and commercial applications. We fabricate vinyl privacy fences with raw materials from ActiveYards, a trusted manufacturer of high-performance vinyl products. ActiveYards' vinyl fencing features a glide-and-lock mechanism that securely locks the components of the fence together from the inside-out. This produces a structurally-sound, gapless fence that is resistant to wind and stands strong against harsh elements like wind and water. In addition, the glide-and-lock technology eliminates the need for screws, which rust over time and decrease the fence's lifespan. Because of its low-maintenance requirements, beautiful look, and affordability, our lifetime warranty-backed vinyl privacy fencing is a property owner's fencing dream. Call J&J Vinyl Fence now to start working with professionals who know how to satisfy your fencing needs. We provide complimentary on-site estimates and 10% discounts to first-time customers. At J&J Vinyl Fence, we offer Santa Monica residential and commercial property owners vinyl semi-privacy fencing that is completely customizable. Our vinyl semi-privacy fences are built with high-quality, reliable vinyl, backed by a manufacturer-issued lifetime warranty. To accent their solid board vinyl fence, customers may choose from an array of lattice or picket toppers, including contemporary picket, traditional picket, or scalloped, which can be combined with gothic, pyramid, New England, ball post, flat top, or solar-powered lighting end caps. Vinyl fences are painted in a white, tan, or wood-grain finish. To get you started, speak with one of our knowledgeable fencing specialists for a free consultation and estimate. First time clients will receive a 10% discount off our services. 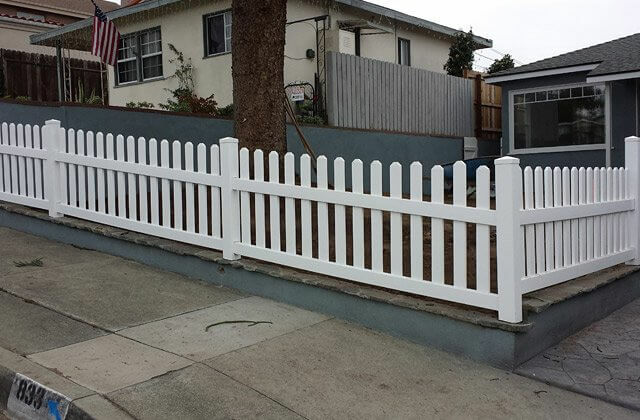 J&J Vinyl Fence has over 35 years of experience installing vinyl picket fencing to upgrade, protect, and define Santa Monica residential or commercial properties. Our custom vinyl picket fencing is an excellent investment that has been implemented in school nurseries, parks, gardens, homes, pools, golf courses, and more throughout Los Angeles County. We have experience working with community organizations, including HOA's, to fabricate a fence that meets and exceeds your expectations. 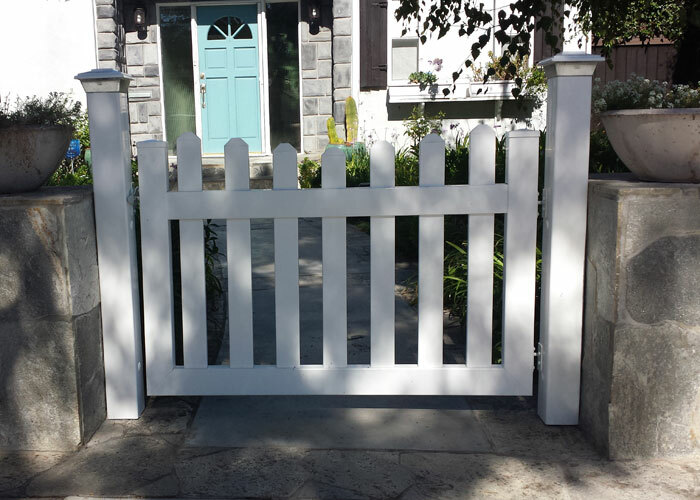 When we fabricate vinyl picket fencing, we custom cut each piece until it's completely symmetrical, and assemble and install your fence with expert precision. 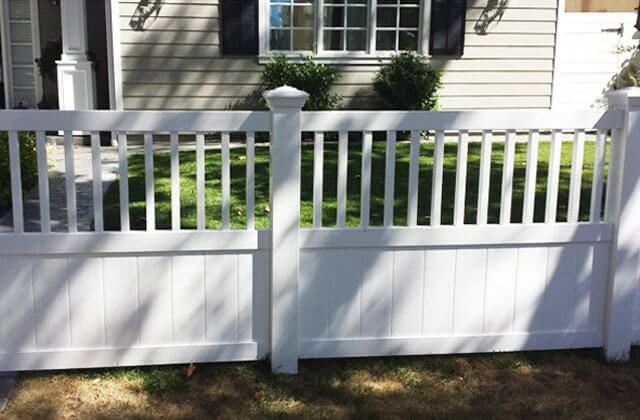 Unlike wooden picket fencing, vinyl picket fencing won't rot, chip, warp, peel, or crack. In addition, we finish our vinyl picket fencing with SolarGuard™ paint for a fence that retains vibrant color for decades longer than the average wooden fence. For a free vinyl picket fencing estimate, call the licensed, bonded, and insured J&J Vinyl Fence today. New clients receive a 10% discount off our services. Vinyl ranch rail is an extremely versatile fencing option that gives residential and commercial properties a contemporary, polished look. It offers a classic, countryside appeal to homes or serves as an ornamental way to distinguish unique spaces. 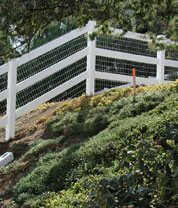 Our vinyl ranch rail fences can be built with one, two, three, or four rails across, or crossbuck rails. They are painted in white, tan, or wood-grain finishes with SolarGuard™, a powerful painting technology that ensures like-new color for years. Vinyl ranch rail is a visually appealing fencing option because of its wood-like appearance, but, unlike wood, it won't rot, peel, fade, flake, blister, or warp. Call J&J Vinyl Fence now to speak with one of our friendly professionals about our free on-site consultations. First-time customers will receive a 10% discount on our vinyl ranch rail fence sales and installation services in Santa Monica. 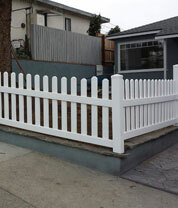 The majority of our Santa Monica clients desire a customized vinyl gate to accompany their vinyl fence. When designing a vinyl gate, we take into account the style and architecture of their fences as well as their specific needs for security and access. 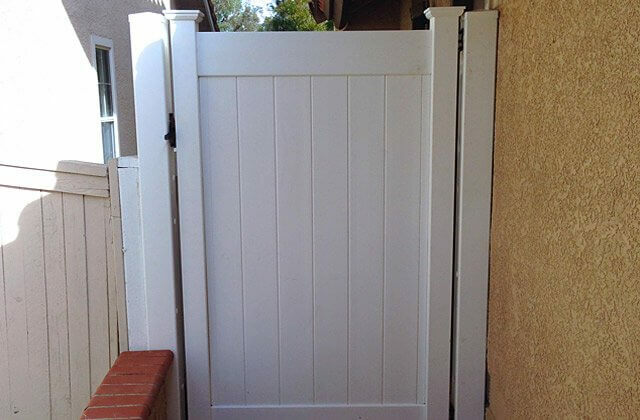 At J&J Vinyl Fence we specialize in the sales, customization, and installation of manual and automatic entry gates, in privacy, semi privacy, picket, and ranch rail styles. To construct an automatic entry gate, we have our own in-house electrician who is extremely familiar with all cutting-edge gate control technology. 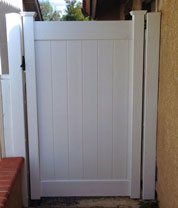 We can program motorized sliding gates, driveway gates, roll up doors, and underground parking overhead gates, to allow secure entrance and exit to your residential or commercial space in Santa Monica. Some of the highly regarded gate operator brands we carry include DoorKing, Elite Gates, LiftMaster, Viking Access, and All-O-Matic. Both our manual and automatic entry gates are available in a white, tan, or a textured wood-grain finish, and built with vinyl that is backed by a lifetime manufacturer-issued warranty. 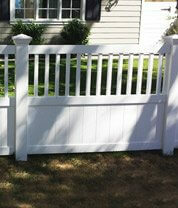 To learn about our complimentary consultations for your customized vinyl gates, call J&J Vinyl Fence today. New customers will receive a 10% discount off our services. Over the last 35 years, J&J Vinyl Fence has fabricated and installed aluminum fencing for swimming pools, front and back yards, school nurseries, gardens, fields, security perimeters, apartment and office complexes, and other types of spaces throughout Los Angeles and the South Bay. Our Santa Monica customer love our custom aluminum fences because they give the appearance of steel or wrought-iron fencing, yet cost much less and are virtually maintenance free. At J&J Vinyl Fence, we will custom create a premium quality aluminum fence and matching aluminum gate. Our aluminum fences feature powder coated aluminum that is backed by a manufacturer-issued lifetime warranty. Additionally, all of the hardware we use is powder coated for exceptional durability, ensuring your fence never chips, peels or cracks. Contact us today for a complimentary on-site estimate, and learn about our first-time customer discounts! Our Santa Monica customers can rely on the quality of our services, in addition to the quality of our long-lasting, beautiful aluminum fencing. 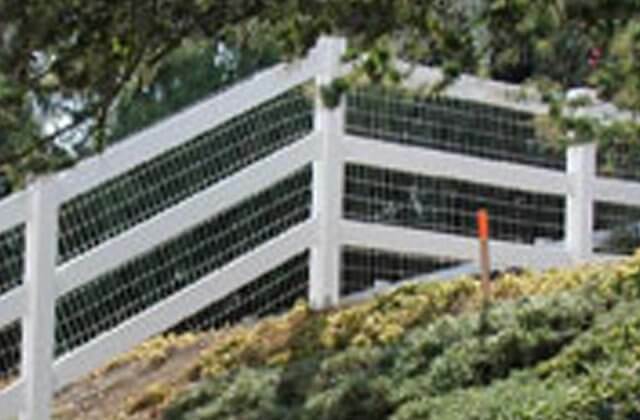 During the installation of this scalloped top white vinyl picket gate in Santa Monica, CA, we also installed solar powered fence post caps, which can last up to 100,000 hours, and give off a soft white light that automatically lights up at night. Solar powered fence post caps are an energy efficient and cost-effective way to light up your entryway.